Welcome to day 4 of the My Creative Time April Release Week! I am so excited to share my project with you! Did I mention this is my favorite release yet??? Today we are show casing the Stitched Journal Dies and stamps. And if you are a smashy or Project Lifer, then you are going to love these!!!!! I cant believe how versatile these are!!!! I have so many ideas in my head!!! For my project today, I made this brag book for our neighbors who recently had a baby boy. Since the mommy's not a scrapper, I thought I would keep it simple. She can just slip the photos right inside the frames. I used several MCT products in this project. I just love it! ***SPREAD THE WORD TO THE WORLD ON FACEBOOK about this release & whatever connections you may have! 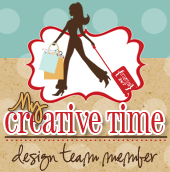 Let us know on "My Creative Time's" FB page herehttp://www.facebook.com/#!/pages/My-Creative-Time/364568506334 that you did so! OR you can just tag me in your post! Thank you so much for stopping by today and make sure you visit the rest of the design team for more crafty ideas! Big Crafty hugs! Oh stop by tomorrow for our big blog hop release!!! WOWIE WOOO what a genius idea....girl you truly are ever so clever....love your idea sooo sooo mucho!!! Just WOW!! I can't wait to make one of these brag book....just so many ideas for it. They will love it. TFS. OMG, your neighbors are going to love this, Nancy! This is absolutely adorable!!! What a cute brag book!!! THIS I FABULOUS!!! I love what you did with this...what an awesome little gift. I am sure she's going to love it! Awesome little mini album love the use of the fun dies and the great colors. Great job. Adorable brag book and great use of the MCT products! This is a very thoughtful gift. TFS! Wow these are awesome. I love looking at each one. Awesome brag book!! The journaling stamp is perfect for this project! What a great idea. This is such a beautiful and thoughtful gift! I absolutely LOVE this and now I have to have one!!!!!! Thanks so much for sharing your ideas. This is AWESOME!!!! wow! this project is awesome!!! so creative!!! i am so excited about that 3x4 die!!! Awesome idea Nancy!!! Love this release too! I LOVE this little brag tag book! Now I want all the tag and frame dies! Okay, secretly I WANT IT ALL ANYWAY! What a great and fun gift. Nancy, I just love how these journaling cards came out. I smash all the time but I'm so considering becoming a Project lifer just so I can use these stamps and dies. Just fabulous!! Love this project! This stamp and die set is the most versatile set I have seen in along time! Great job showcasing it. I think your neighbor will love it! Awww this is so cute!! I love that you have made it easy for the mom to just put the pics right in there. I love, love the sneaky peeks for today, my favorite by far! I just got some some project life items and now I can't wait to order this release to use in it!! Love, Love, Love These!!!! Bravo!!! Your neighbor will love this book...I love the simple clean look to the pages. The stamps and dies are so perfect for this as well as cards. Wonderful job! What a fabulous gift idea, I am sure the neighbors will love it!! What a great idea for a new mom! Absolutely LOVE this! What a great idea! Great colors and all of the embellishments are awesome! WOW!! How fun is this!! Oh the memories you can add to this is awesome!! What a great gift and great idea!! I can't wait to get these dies!! Nancy ~ Oh what a AWESOME and CLEVER way to use this new dieand the stamps! I LOVE it!! The details are so fun and SPECTACULAR!! Always so fun to see what creation you are up too!! AWESOME job!